Vice and Harkat present a docu screening and a performance on how rap in India went from derivative to original over the last years. It got co-opted quicker and hit the mainstream without much warning. Mumbai rap, which also got known as gully rap, saw an even sharper rise and eventual breakthrough into the realm of Bollywood. 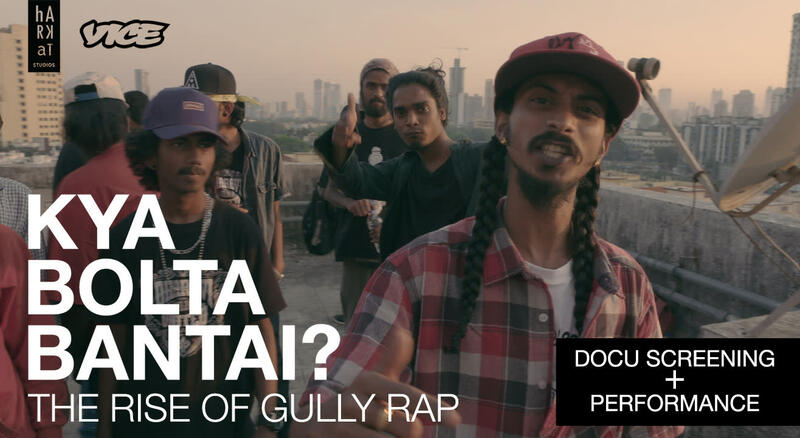 With first generation crews like Mumbai's Finest grinding it out, to names such as DIVINE and Naezy who popularised the genre in recent years, and actor Ranveer Singh portraying a rapper in Zoya Akhtar's next big release - gully rap is here to stay. Kya Bolta Bantai is the story of that journey. Docu Screening followed by a short gully rap performance. Harkat is an international boutique arts studio with a passion for film, new media, community art spaces and contemporary art. Based in Mumbai & Berlin, Harkat takes many forms and identities across disciplines & related creative industries. As an alternative performance & arts space, we have hosted more than 150 shows in the past year in the mediums of theatre, film, music, community projects & contemporary art. We support the new, unheard, upcoming, exciting, cutting edge, the political, the forgotten, nostalgic, melancholic, soul stirring, the beautiful & more. And that's what Harkat is. Harkat.